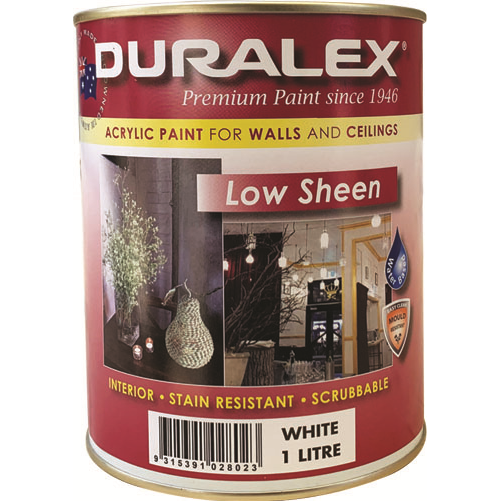 A Premium Quality Low Sheen, 100% Scrubbable, Acrylic High Opacity House Paint. Duralex PREMIUM LOW SHEEN is a premium quality, scrubbable, acrylic paint which dries to a smooth, low sheen finish on appropriate and properly prepared interior and exterior surfaces. Special micronised pigments are used to achieve a smoother and NON SOILING surface which is 100% scrubbable. Ideally suited for walls and ceilings in laundries, bathrooms, children's rooms, garages, etc. It may be used in food preparation areas, eg. bakeries, confectionery buildings, kitchens etc. 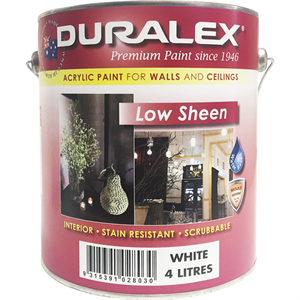 It is not recommended for use on door or window trims, turps-based enamels are best suited for these areas. Available in White and Tint Bases, which are compatible with all major tinting systems. Tinter, if added, should be shaken or stirred in thoroughly immediately after addition. Sizes 500mL, 1 Litre, 2 Litre, 4 Litre, 10 Litre, 15 Litre and 20 Litre. Coverage A maximum coverage rate of 16m² per Litre. 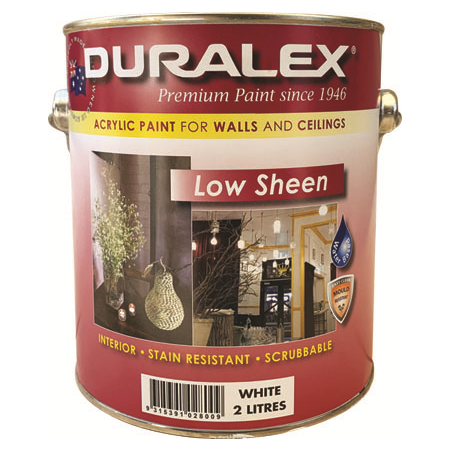 This may fall below 10m² per Litre when painting corrugated, rough or absorbent surfaces. Ventilation Allow adequate cross ventilation when painting indoors during and after use to dissipate water vapour.